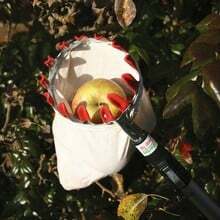 Don't let all your hard work throughout the year go to waste by dropping ripe tree fruit when harvesting - the Fruit Picker Basket & Handle is just perfect for collecting fruit from those uppermost branches. The lightweight telescopic aluminium pole extends from 1.8m/5'9" to 5m/16'5", putting you well within reach of the juicest fruits, and the task of harvesting fruit is made easy. Extra Value - Buy the Fruit Picker Basket & Telescopic Handle and Save £2! The stem is not cut as the basket is positioned beneath the fruit and the stem between the basket's 'fingers' and a slight twist is all that is needed to snap the stem. The basket catcher is made from soft cotton for bruise-free fruit. This is a very useful tool. I can now reach up to the top branches and catch the fruit. 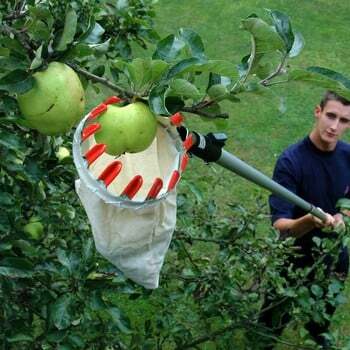 Excellent apple picker to retrieve Bramleys in top of large tree. Our horticulturist Martin Fiddes says; "Pick your apples very carefully to avoid bruising and damage, both of which will provide an entry point for rots and fungal diseases - that's why the soft linen basket of the apple picker and telescoping handle make a careful combination! The perfect set for picking your hard-to-reach apples, pears and plums without bruising, as well as pruning higher branches without the need for a ladder. Harvesting your fruits from the highest branches of your tree can be a real challenge - you don't want your hard work throughout the year to go to waste by dropping ripe fruit. 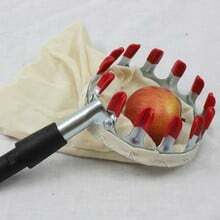 This product is specially designed to help you with this task. The lightweight telescopic aluminium pole extends from 1.8m to 5m, putting you well within easy reach of your juicy fruits.